An unusual simulator, in which your objective is to bring to life a perfectly functioning species of organisms, starting from the lowest step on the evolution ladder. Will Wright is one of the most prominent characters in the PC gaming industry. He is the one responsible for such blockbuster series as SimCity and The Sims. Spore for PC is yet another production by him, drawing attention due to unusual design and gameplay. Almost every game from Wright was focused on developing, be it a single person or a whole community. This is also true in Spore, where you have to bring your civilisation to greatness, starting from the lowest step on the evolution ladder – a microorganism. Gameplay is divided into stages in which you assist your creature’s development. Each stage announces a completely new mini-game with rules differing from those in the former ones. In the first one, you face a Pac-Man clone. Your cell, submerged in water, constantly needs to be fed (with other organisms too) and at the same time not get eaten by other, similar creatures. If you provide “the hero” with enough food, you will be awarded with an possibility of development, or rather – evolution, and go to the next stage – the development of a humanoid form of life. Spore Creatures Creator always pops up at the end of subsequent stage. You can freely experiment with your creature’s looks by adding limbs, mouth, etc. Even though the game itself calculates the way our experiment will move and eat, do not cross the line. The creature that has problems with maintaining its basic life functions will not survive another stages, e.g. in the water and then on land. With the progress the player stops taking care of the single creature and takes control over a whole tribe of bizarre beings, which brings Populous to mind. At this level, the Creature editor is replaced by a similar tool for constructing buildings. The pace in which the civilisation grows stronger and stronger depends only on the player’s creativity. When a small village turns into a humongous metropolis, it is time for another stage – rivalry with other tribes. Now there is only one step from Sid Meier’s Civilization. The moment your creatures construct a flying saucer, you go to space, where you will develop and invade surrounding planets. There is no limit on options and possibilities in Spore. It is the player who decides what to do and what the creatures will look like. From a bacterium to intergalactic empire – even though it sounds like an absurd, it all actually adds up. 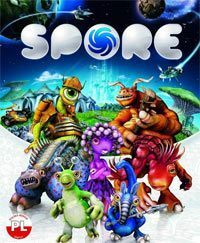 Spore Creatures Creator was released a few months before the premiere Spore as a stand-alone application. Still, it is an integral part of Spore itself. This guide explains all of the gameplay’s mechanisms: from the cell to the space level.